My rant about how large Planet Earth is; and about the hubris of our species. Sometimes, humans have no clue. Wrote it last night. Out today. The pleasure of web-zines is their immediacy. Mortality is not something we associate with air travel these days. Unlike our ancestors, we aren’t superstitious about planes falling from the sky—until they do. We buy and cancel tickets—even international ones—with a few clicks. We call them trips, not voyages or even journeys. Travel has become a job; a chore; a ‘red-eye’ that you catch; miles that you rack up; frequent flyer numbers that you proffer, punch or swipe; abbreviations that you remember—LAX, JFK, MUM—as a badge of honor. For most of us, air travel is an activity as mundane as our kids catching a schoolbus. You wake up at dawn, send them off and catch a taxi to the airport. Every once in a while, a horrific incident happens that jolts our insouciance and takes us back to the time when travel was viewed with trepidation and respect, not merely a matter of routine. And then we must decide what to make of it. For the relatives of the 370 passengers who are presumed dead, it is a time of gnawing anguish coupled with a yearning for answers about what happened to the Malaysian Airlines flight. What caused this massive Boeing 777 to veer so far off-course and then plunge into the cold depths of the Indian Ocean? For the rest of us who have watched this unfolding tragedy from afar, it is a time of empathy and compassion for those who have lost loved ones. It is also a time to take stock and pay heed to the vastness of this planet that we inhabit. It is humbling to realize that in this age when humans have travelled to distant galaxies and seem to have mapped every location on earth, there are still spots where a jet plane can get lost; and cannot be found—not for 17 long days. Scale is hard to comprehend. The jet is supposed to be 3600 m below the ocean—a number that means little to us. As is beautifully illustrated in this article in Australia’s news.com, that is about the depth of 10 Empire State buildings. To say that the oceans are vast is to state the obvious. It is something that we find hard to understand. It is only when a large jetliner disappears for 17 days in spite of best efforts by multiple governments that we can intuit the standing of our species in this bafflingly big planet that we are privileged to inhabit. It is only when we realize that a special submarine may be called to action, simply to spot the thing that we realize how deep our oceans are. Our hubristic parochial approach towards Planet Earth prevents us from fathoming that a jetliner can be swallowed by the ocean; that the human footprint doesn’t reach everywhere; that there are still secrets that nature can hold, even when the whole world is searching. Our natural world is massive; we inhabit a small portion of it. Disasters, whether they are natural or man-made, bring with them a new set of learnings. 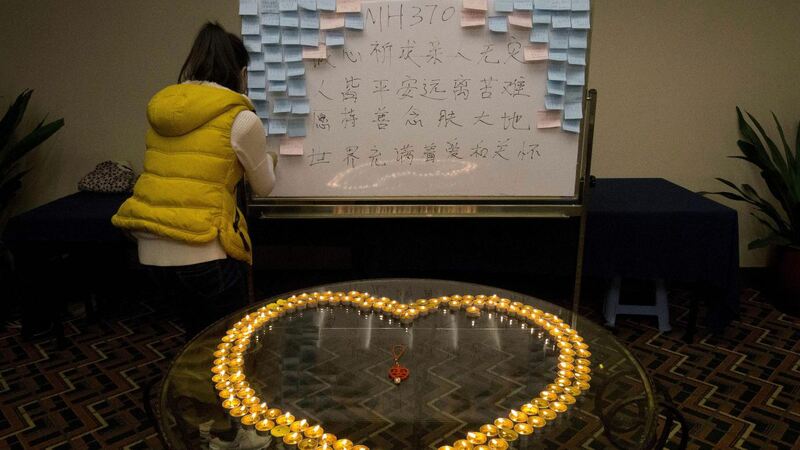 This one has brought forth a fresh set of theories from experts on everything from how to make airline transponders automatic to recalibrating methods of searching for a missing plane. For those of us who are mere travelers, this baffling tragedy has brought forth questions about destiny, fate, and renewed questions about the safety of air travel. Travellers of yore were superstitious. They knocked on wood; returned home when a black cat crossed the street; and stayed away from the number 13. It was an acknowledgement of the unknown dangers that travel presented. Russians sat on their luggage before leaving home. The Chinese didn’t inhabit seats or rooms with the number 4, considered unlucky. Indians didn’t travel south on certain days. The Senegalese would not inform friends before they travelled anywhere because they worried about the evil eye. Our grandparents had a healthy respect for the unknown dangers of travel. Superstitions were a way to keep fear at bay; to exert a measure of control over what was then a journey in the truest sense of the term: to traverse the unknown. We may not be superstitious about travel any more; we may seek to control errors, both mechanical and human; but every now and then, an incident occurs that is beyond human reckoning. It lends perspective. It demands respect. It requires that we pay heed and recalibrate how we function. Follow Shoba on Twitter @ShobaNarayan. We welcome your comments at ideas@qz.com.